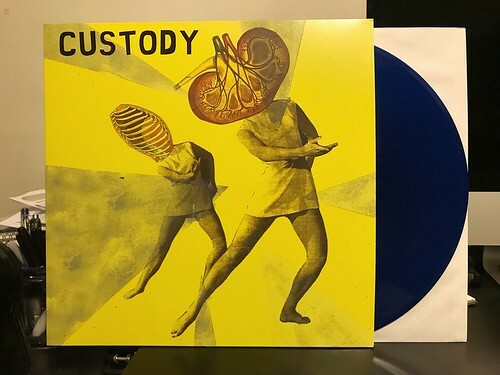 Custody are from Finland and hot damn what a great, great band they are. So much so, that last year I put my money where my mouth was and helped release one of their 7"s. While PopKid wasn't able to get involved with their debut full length, I can unquestionably say that: 1. It's great and 2. I really wish this was on PopKid. It would have been a wonderful addition to our catalog. Custody have a knack for melodic punk in ways that I have not seen in many years. They have a 90s leaning style that often makes me think of Samiam in the way they craft their melodies and hooks. But to get the full picture you need to add in a band like Starmarket in the way they are able to inject fierce energy and super dynamic guitar interplay. Each of the album's ten songs just knock me over again and again. They have an uncanny ability to craft their songs in a way that uses the verse as a launching pad for their killer choruses. Custody also has incredible skill with constructing the instrumental portions of their songs, with perfectly placed bridges and honestly, some of the best song outros/conclusions that I've ever heard. Custody's debut full length is so clearly one of the best albums to come out in 2018 so far. I can't recommend it highly enough and I hope these guys keep cranking out records for many years.